It’s hard to believe that, not that long ago, the San Francisco 49ers were a good team with a good head coach. 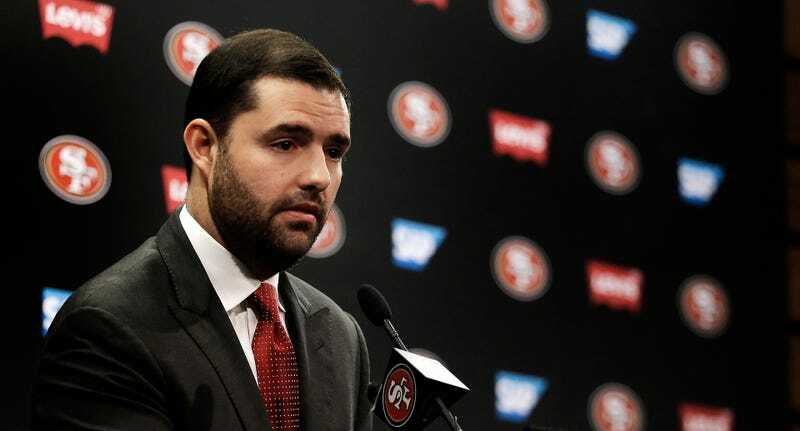 It’s been a disaster since owner Jed York shuffled off Jim Harbaugh in December of 2014, and yesterday’s dual firing of head coach Chip Kelly and general manager Trent Baalke has put the franchise near rock-bottom. I say “near” because as bad as things are now, there’s no reason to believe York can’t make them worse. Consider how the 49ers got here. After three straight seasons that ended with at least a trip to the conference championship, Harbaugh guided his team to an 8-8 year in 2014. He was then fired by York—the team insisted that it was a “mutual parting,” but everyone who knows even the slightest bit about the organization agrees that Harbaugh was fired—because York apparently didn’t get along with Harbaugh anymore. York then proceeded to move his team into the next era by assembling the cheapest coaching staff possible, blowing a shot at hiring Adam Gase to be the head coach because he wanted to keep company man Jim Tomsula in a position of power, giving the head job to Tomsula anyway, and then firing his chosen man after one season in charge. And now here we are again, with York firing his head coach after Week 17 for the third consecutive year. There’s no reason to feel sympathy for Kelly, who only managed to beat the Los Angeles Rams this year, but it is downright strange to see a head coach get sacked after just one season in charge, particularly one in which there was no expectation for the team to be any good. And this is the second straight season York has made a one-and-done firing! Who the hell is going to want to work for this guy in the future? York told The MMQB’s Peter King that Baalke and Kelly were fired because of a “disconnect at the top,” and that his goal is to “re-establish a championship culture.” The 49ers are a terrible football team, and there are a great many obstacles standing between them and a return to a “championship culture.” I don’t think any obstacle looms larger than York’s haphazard meddling. How Else Did The 49ers Screw Up Their Coaching Search?